ACfurnaceGTA Corp. is a Member of the ECO Group of companies established in 1997. Being the member of the biggest HVAC group of company allows us to offer you widely recognized and respected brands such as American Standard, Payne (Carrier), Ducane, Armstrong Air, Lennox, York, Goodman, Amana,, Keeprite at reasonable prices. Our company is made up of professional TSSA-licensed technicians, gas fitters, inspectors, heating and cooling specialists in and around the Greater Toronto Area (the GTA), and we are pleased to offer our customers a wide range of high quality HVAC services at low prices. !!! 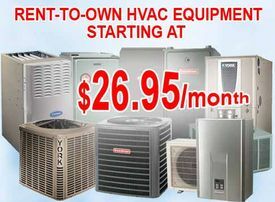 Selling more than 100 HVAC units a months gives us a great pricing advantage, allowing us to sell for less!!! THE ECO GROUP OF COMPANIES WAS ESTABLISHED IN 1997, SINCE THAT TIME WE HAVE HUNDREDS OF SATISFIED CUSTOMERS ACROSS THE GTA. ASK US FOR REFERENCES FROM OUR BEST SALES PEOPLE, OUR CLIENTS. BBB REGISTERED A++ BUSINESS. HOME STARS 9.9 STARS out 0f 10!!! These days, people in Ontario have access to OPA Rebates that encourage the adoption of more efficient, money-saving products that also reduce their carbon footprints. That means you can upgrade your old furnace or air conditioner to a new high-efficiency, more environmentally friendly HVAC system and receive up to $2100 in government rebates. That’s great for your wallet and the environment. We sell only top-quality HVAC brands in Toronto and the GTA, at the best prices. Guaranteed. Furnaces that are 95% efficient can help an average family in Ontario save up to $60 per month just on their gas bills only. Given that the average cost of a brand-new Energy Star, high-efficiency Furnace is just starting at just $49.99/month (plus HST) there has never been a better time to upgrade your old HVAC system. And don’t forget, we guarantee the best prices on Goodman heating and air conditioning systems, so you can buy with confidence. GET AN OFFICIAL QUOTE FROM ANY HEATING CONTRACTOR IN THE GTA, AND THEN CALL US. WE WILL BEAT ANY PRICE ON GOODMAN FURNACE, GUARANTEED. OTHER ENERGY STAR HVAC PRODUCTS. Call us today +1 (855) 554-9595 for a free quote on Energy Star products and our in-home service, and start saving now.